Giving to a local nonprofit is a way to invest in the important missions each of them are stewarding on behalf of the communities they serve. We encourage a vibrant spirit of philanthropy among all Arizonans, and we applaud you for your desire to serve the nonprofit community through your gift - whether great or small. We have nearly 900 nonprofit members in our online directory, which you can search by geographic area, cause or mission type, and a variety of other search areas. You can then learn more about them and find contact info from their online profiles. This exciting program gives donors an opportunity to give to their favorite nonprofit online 365 days a year and in a secure, easily searchable way. The program is tied to Arizona's largest online giving event, Arizona Gives Day, a single, statewide day of giving that has raised more than $13.4 million for Arizona Nonprofits since 2013. 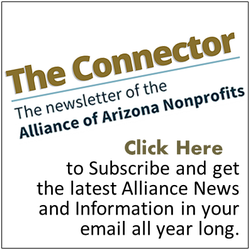 Arizona Gives is powered by the Alliance of Arizona Nonprofits, Arizona Grantmakers Forum and the generous sponsors who make the program possible.